Very Good. 1594133328 ALL BOOKS SHIPPED WITHIN 1 DAY OF PURCHASE! Good. 0143114964 Ships promptly from Texas. Book was not what I had expected.. Skimmed it, then threw it out! Michael Pollan is not a nutritionist but he certainly makes more sense than most of them! His common-sense approach to food is refreshing and truly brings the reader back to the basics. I have purchased this book for my mother and suggested it to numerous other friends. Following his guidance will certainly make any reader a much healthier (and happier) person. Everyone should read this book before their next trip to the grocery! We all need to take action to insure the safety and sustainability of our food chain. You can make change just by reading the labels and knowing what you are eating. If you don't buy it, maybe it wont be so profitable and reason will re-enter the marketplace. Unique insight to our nation's obsession with food and dieting. A "must read" if you've ever wondered why it's so difficult to find "real food" (as opposed to prepackaged, precooked, heat-n-serve) in the supermarket. 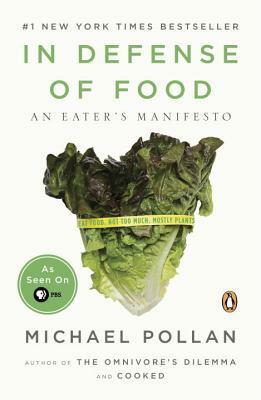 Heard an interview with M. Pollan on NPR and bought book immediately...it changed how I view and shop for food. I used this book with a class of first-year college composition students. They resisted at first because "they" knew all about food and their favorites, that were, of course, boxes and packages: food products. They ended the semester advocates of Pollan's philosophy. I did not preach at them; I let Pollan's words, and their need to write essays on the book's content, change their attitudes. I loved observing the changes in even the most resolute of Big Mac eaters!